KENT, WA – After Kruise Reddick’s two-goal, four-point performance in his home regular season finale the night before, it seemed only fitting that he end his last regular season game with yet another game winner. 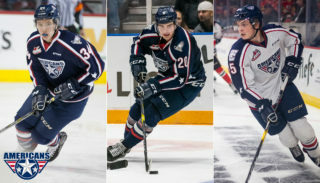 Jordan Messier had a three-point night and Reddick recorded his 21st game-winning goal of his career, as the Tri-City Americans (44-24-2-2, 92 pts) finished off the Seattle Thunderbirds (27-35-5-5, 64 pts) 4-3 in overtime in front of 3,494 fans at ShoWare Center. With the win, the Americans wrap up the 2010-11 regular season with a three-game winning streak and a perfect 9-0 record against Seattle. It’s the first time in the franchise’s history that Tri-City has swept a regular season series against the T’birds. Conversely, Seattle ends their 2010-11 campaign by dropping their third straight game and fifth game overtime. After an emotional win over their arch rivals on Saturday, Tri-City carried that momentum into the first period against Seattle, outshooting their opponent 14 to 7. However, after the first 20 minutes of play, it was the T’birds that held a 2-1 lead. Just 2:09 in the contest, Seattle took the early 1-0 advantage. Following a Tri-City turnover, Marcel Noebels skated in as part of a 2-on-1 breakaway on Americans’ starter, Chris Driedger. From the left circle, Noebels found space just over Driedger’s glove, picking up his 28th goal of the season. With 6:30 remaining in the period, though, Tri-City tied the game on Drydn Dow’s fourth goal of the season. Following up on a rebound of a Lucas Nickles shot, Dow swept a backhander past Michael Salmon, tying the game at 1. But, with just over a minute left in the first period, Luke Lockhart fed Connor Sanvido out in front, who proceeded to net just his second goal on the year. At the 6:30 mark of the second period, Messier connected on his 26th of the season, tying the game again for Tri-City. Then, nearly 20 minutes later, and on the power play, Messier set-up Justin Feser, who slipped a shot between the pads of Salmon to give the Americans their first lead at 3-2. However, with 3:44 left to play in regulation, Tyler Alos took advantage of a fortunate rebound of a Lockhart shot that went off the back wall and straight into the slot. Alos lifted a backhander past Driedger, knotting the game at 3 before eventually heading to overtime. Once in the extra-session, it took Tri-City until the 2:39 mark before Connor Rankin broke out Messier and Reddick as part of a 2-on-1. Messier eventually dished it to Reddick, who capped the scoring in the contest with his 20th goal of the season. Both back-up netminders started tonight’s game, as Salmon finished with 28 saves on 32 shots, while Driedger stopped 30 of the 33 shots he faced. Driedger finishes his rookie WHL season with a 6-6-0-1 record, while Salmon fell to 0-2-1-0 on the year. Tri-City finished the night 1-for-4 on the power play and was a perfect 2-of-2 on the penalty kill. 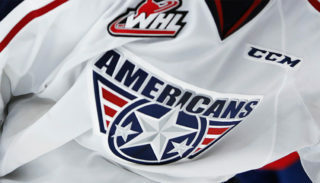 With another successful regular season in the books, the reigning Western Conference Champions will now turn their attention to the 2011 WHL Playoffs. 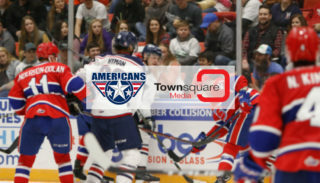 The #4-seeded Tri-City Americans will open their defense against the very team they beat to claim the title last year, the #5 Vancouver Giants (35-32-1-4). The best-of-seven, opening round series will kick off on Friday, March 26 at the Toyota Center. Game time is 7:05 p.m. The Americans and Giants are set to meet for just the second time in the post-season, with Tri-City taking out Vancouver 4 games to 2 last season. Tri-City also won the regular season series 3 games to 1. 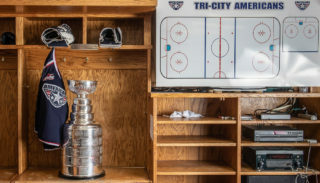 Tickets for Tri-City’s first round playoff series will go on sale on Monday, March 21 at 2:00 p.m. through all Ticketmaster outlets, including the Toyota Center box office, all Fred Meyer locations, or online at ticketmaster.com. On behalf of Kruise Reddick and the Tri-City Americans, we want to thank everyone that chose to take part in this worthy fundraiser, benefitting the local chapter of the Muscular Dystrophy Association.